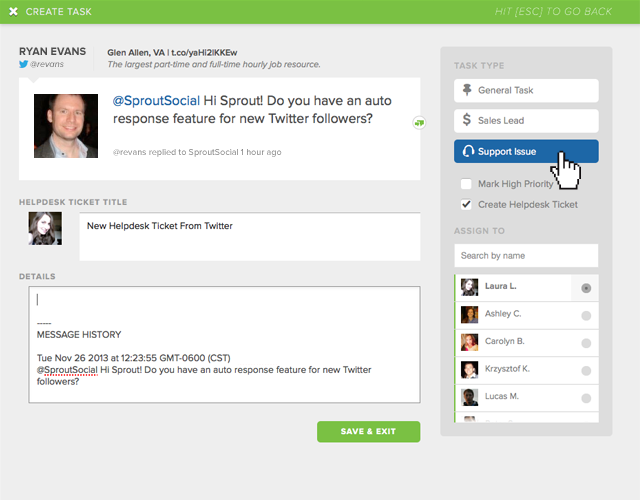 Sprout Social & Zendesk have partnered to make social media customer support truly seamless. Today, we’re happy to introduce our first HelpDesk software partnership with Zendesk. Zendesk is a leader in the help desk world, and now our customers enjoy the ability to easily create and manage HelpDesk tickets from any social media message (including relevant context) directly from Sprout Social. The two-way integration allows both support and social teams full visibility into an open ticket allowing frictionless communication with the customer, quicker response times and a great customer experience. Once a ticket is created, both sides stay in synch, alerting each to changes in status, comments and updates. Bringing a support issue to resolution directly from Sprout while saving all of the history in our social profile keeps your processes efficient and your teams empowered. Zendesk Integration is available at no additional charge with Sprout’s Corporate plan and above. Visit Settings > Helpdesk for instructions to setup and manage your Zendesk integration. For more information, contact support@sproutsocial.com or through any of the usual channels. We hope you enjoy the new enhancements – feel free to reach out to us @SproutSocial and let us know!